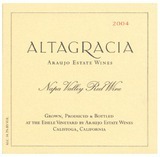 The 2004 Altagrácia expresses the vibrancy of the younger Eisele Vineyard Cabernet Sauvignon fruit, blended with estate Merlot, Petit Verdot and Cabernet Franc. The second cabernet of the estate, it is a serious, compelling wine with opulent fruit and seamless tannins. It exhibits a rich bouquet of warm huckleberries and dried cherries, spiced with cinnamon, espresso, shaved pencil, dried bay leaf and sage. Notes winemaker Francoise Peschon: This blend produced mouth-filling wine of deep color and smooth, sweet tannins. Its intense berry flavors and intriguing slate and mineral notes provide density and complexity. It is ready to drink now, but will easily age for years. ($95; 66% cabernet sauvignon, 14% merlot and 10% each cabernet franc and petit verdot; aged entirely in new oak) Good red-ruby. Aromas of raspberry, smoke, gravel and nutty oak. Smooth in the middle palate, with flavors of plum, mocha and tobacco and nicely integrated acidity. The building tannins are a bit hard-edged, but this second wine, from young vines and "less-good lots," offers attractive sweetness, good life and firm structure.